Journalist, conservationist and artist John Frederick Walker recently tracked giant sables in Cangandala Park with Pedro Vaz Pinto and biologist Richard Estes. He has written about his experiences in the May/June 2009 issue of Wildlife Conservation magazine. 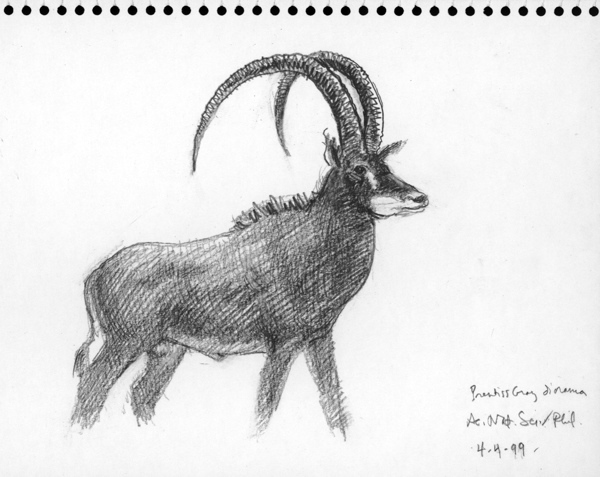 Click here to download a PDF of Mr. Walker’s 3-page article, titled, “Icon on the Brink: Angola’s Giant Sable Antelope”. This article is reproduced with permission of the author, all rights reserved. Mr. Walker is the author of A Certain Curve of Horn: The Hundred-Year Quest for the Giant Sable Antelope of Angola (Grove Press, 2004). His latest book is Ivory’s Ghosts: The White Gold of History and the Fate of Elephants (Atlantic Monthly Press, 2009). Find out more about Mr. Walker at http://johnfrederickwalker.com/.